A new trailer has been released for director Xiao Feng’s upcoming World War II action drama The Bombing which stars Bruce Willis, Ye Liu, Fan Binbing, Nicholas Tse, Adrien Brody, William Wai-Ting Chan, Wei Fan, Janine Chun-Ning Chang, Simon Yam, Eric Tsang, Shengyi Huang, Xiaoqing Liu, Wu Gang, Feng Yuanzheng, and Tenma Shibuya; watch it here Asura. 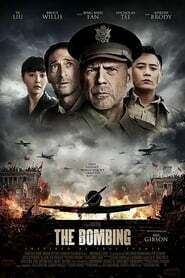 Directed by Xiao Feng, (The Bombing) is a Chinese war movie set at the beginning of the Second World War. 5 Chinese soldiers will face Japanese aviation, with the objective of protecting a stronghold in Chongqing Tag. Bruce Willis and Adrian Brody will play alongside Ye Liu, Binb Bing Fan and Nicholas Tse. The Chinese release is scheduled for early August, and the effects have been entrusted to Macrograph. For the moment, no French version or subtitled in French seems available Destroyer.